Throughout the year, Temple Beth El holds fund raisers that benefit the Las Cruces community in a variety of ways. 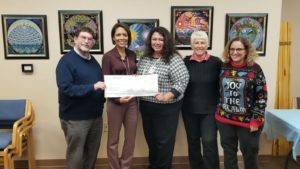 At the beginning of the Board of Trustees Meeting on Thursday, December 13, 2018, Temple Beth-El presented a $1000 donation to Mesilla Valley Hospice from fund raised by the Matzo Ball Open Golf Tournament. In the photo are, left to right: Rabbi Larry Karol; Nina Salmon (Executive Director, Mesilla Valley Hospice); and Lorraine Padilla (Director of Human and Community Relations, Me- silla Valley Hospice); Lynn Zeemont, chair of the Matzo Ball Open Golf Tournament; and Temple President Ellen Torres.